Join us for the "Terror from Beneath the Earth" world premiere on Wednesday, May 20th, 2009 (7:00 PM) at the Heights Theatre in Columbia Heights, Minnesota! The event is open to the public and the price of admission is only $5.00 per person. This is your chance to experience the film before the rest of the world, and enjoy a program complete with era-appropriate newsreels, appearances by most (if not all) of the cast and crew, free cake, autographs and photos with the actual creature from the film. (Don't forget to bring your camera!) DVDs, posters and other merchandise will also be on sale at the event! Advance tickets to the premiere are AVAILABLE FOR PURCHASE at SaintEuphoria.com, the online home of the films of Christopher R. Mihm! Advance tickets cost $10.00 and include exclusive merchandise not available with normal admission. By purchasing an advance ticket, you'll receive an individually-numbered collector's ticket, a free "Terror from Beneath the Earth" poster (available at the event), AND an exclusive piece of the cave set used in the film, framed and signed by writer/director Christopher R. Mihm and the man inside the monster costume, Michael Kaiser! NOTE: Advance tickets to the premiere are not required and are available in quickly diminishing limited quantities! Purchasing advance tickets is not required to attend the event. No matter what, and based on advance ticket sales, there will be at least a small number of general admission tickets available at the door. "Terror from Beneath the Earth" World Premiere! With the world premiere of "Terror from Beneath the Earth" fast approaching, writer/director Christopher R. Mihm spent the majority of March putting the finishing touches on the film's DVD release. In addition to the film itself, the disc will contain a bunch of special features -- including commentary with writer/director Christopher R. Mihm and actor Dan Sjerven (also known as Lt. Elliott in "Cave Women on Mars"), the film's trailer (currently viewable at SaintEuphoria.com), an "Evolution of the Bat" featurette (chronicling the film's creature costume from conception to realization), a special introduction to the film by horror host Dr. Ivan Cryptosis, a production photo gallery, "enhanced" english subtitles (if you don't know what "enhanced" subtitles are, try watching previous Christopher R. Mihm films with the subtitles on! ), a blooper reel and multiple "Easter eggs." The DVD will be available at the world premiere and online the next day! In anticipation of the big premiere event, we again present two more character images from "Terror from Beneath the Earth." Last month, we revealed the Johnson children, Alice (Elizabeth Kaiser) and Danny (Elliott Mihm in his first role). This month, we get a glimpse of the last two major characters in the film, Stan Johnson (Dan Sjerven) and Sheriff George Elliott (Justen Overlander). Lastly, "Terror from Beneath the Earth" has already been accepted to the 2009 ShockerFest International Film Festival! 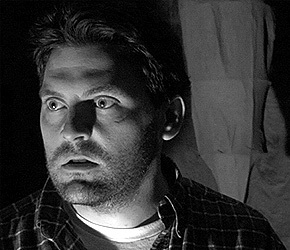 To date, a Christopher R. Mihm film has screened at ShockerFest every year since "The Monster of Phantom Lake" in 2006 -- the same year that film won a "Director's Choice" award. "It Came From Another World!" pulled in the "Best Sci-Fi Feature" award at the 2007 event, while "Cave Women on Mars" was only able to secure an honorable mention in 2008. As of this moment, we have no specifics on exact dates and/or screen times beyond knowing that this year's festival takes place during the last weekend of September. Starring John Agar and Lori Nelson. 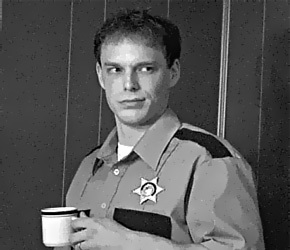 "Illegal Use of Joe Zopp," a film featuring Mike Cook (Gustav/Dr. Edwards) screens at the 2009 Wisconsin Film Festival in Madison, WI. Tickets are $11.00, including tax, and are available through the Wisconsin Film Festival's website. "The Monster of Phantom Lake" and "Cave Women on Mars" screen as a special double feature at the Xanadu Las Vegas sci-fi/fantasy/art/technology convention. The screenings were secured by Rachel Grubb (Amy/Hagra) who will be in attendance selling and signing merchandise. The convention will also screen other films featuring Rachel, including "Tales of the Dead" with Brooke Lemke (Eina) and "Harrowville" with Emily Fradenburgh (Gorga) and Mike Cook (Gustav/Dr. Vincent Edwards). The fashion designs of "Cave Women on Mars" costumer Brittany Hughes will be featured at the Kimberly Sun Presents Rumors Spring Fashion Show & Dance Party. "Terror from Beneath the Earth" premieres! Advance tickets are currently available! "Terror from Beneath the Earth" debuts at the drive-in! The movie screens as the third film of a triple-feature at the Hi-way 18 Outdoor Theater in Jefferson, Wisconsin. Justen Overlander (Jonathan/Sheriff Elliott) continues to update his blog "MN 2 Hollywood" with tips and observations on making it in the entertainment industry. He is currently producing a new mock soap opera, "Soap Athetic," which will be released on Numa Network later this month. "The Monster of Phantom Lake," "It Came From Another World!," and "Cave Women on Mars" DVDs are now available at SaintEuphoria.com, the online home of the films of Christopher R. Mihm. In addition, "The Monster of Phantom Lake" Collector's Edition DVDs, exclusive movie posters, patches and other merchandise is now in stock. Everything is available in extremely limited quantities so get yours today before they run out!